Ecological and vegetative characteristics of a potent invader, Hyptis suaveolens Poit. from India. Hyptis suaveolens Poit a member from Lamiaceae family has naturalized in India and is considered as a potent invader. Although it has several medicinal properties and used in folklore remedies but its spread is so fast that in due course of its establishment it disrupts the recruitment pattern in the nearby occupied. Not only it restricts the area for other species but it increases livestock pressure on the native species because of its unpalatable nature due to presence of essential oils. It has spread at an alarming stretch in the Vindhyan highland and adjoining areas along with other parts of the India. Its population expansion is so fast that it may prove to be an established invader in near future. Present paper deals with different morphological and reproductive characteristics of Hyptis which confer greater advantage to Hyptis in comparison to other species growing in its vicinity along with control methods prescribed for Hyptis to check its growth. Key words: essential oils, Hyptis, invader, Lamiaceae, Vindhyan forests. Hyptis is a genus of Lamiaceae with about 400 species (Willis 1973). Most of the species are native to the tropical America (Hickey & King 1988, Hutchinson & Dalziel 1963) and extends from Southern United States through the Caribbean region and Central America, south to Argentina (Srivastava 1976, Aluri & Reddi, 1989). But few of these species has naturalized in the warmer parts of the old world (Harley 1988; Aluri & Reddi, 1989, Holm et al. 1979). One of the species from genus, Hyptis suaveolens Poit (referred as Hyptis hereafter) is naturalized in India. It has now established in Deccan Peninsula, North East India, Vindhyan Highland and Andaman and Nicobar Islands (Wealth of India 1959; Yoganarasimhan 2000). Hyptis is of common occurrence along the rail tracks, roadsides (Verma & Mishra 1992), foothills of open forests, forest clearings (Mudgal et al. 1997) and can heavily infest wastelands particularly arid and rocky substrates. It is a ruderal weed (Walter 1963 Keller & Armbuster 1989, Aluri 1990) and is capable of heavy infestations displacing native flora and is said to be a potent invader of Vindhyan Highlands (Sharma et al. 2007). Present paper investigates ecological and vegetative features of Hyptis which favour its growth and invasiveness. Hyptis is a rigid annual herb of aggressive nature (Mudgal et al 1997). It starts its vegetative phase either from perrenating rootstock or viable seeds either from persistent seed bank or from fresh stock with the onset of monsoon rains (Figure 1). It can attain height of approximately 2.5 meters within a growing season. Its stem is quadrate and bears hair. Leaves are either ovate or obovate. Leaves are generally 3-5 cm long and 2-4 cm wide with serrulate margins and a long petiole. Lower surface of the leaves bears hairs; petioles up to 3 cm long. Flowering starts in it at an early age of two to three months. It produces copious blue flowers in small cymes along branch that ends with reduced leaves. Calyx is hairy in nature and is nearly 5 mm long in flower while it enlarges to 10 mm long in fruit and become ribbed. Corolla is blue, strongly zygomorphic and bilabiate, declinate, and about 8 mm long, with a limb 5 mm in diameter. The flower has 4 stamens. Hyptis flowers are pollinated by a large number of pollinators leading to enormous seed production (Plate 1). Hyptis fruits (nutlets) are about 1.2-1.5 mm long and seeds are protected in spined burr which help in its dispersal and are slightly notched at the end (Stone 1970). Seeds of Hyptis are characteristically dimorphic. This dimorphism is reflected in the seed size (Wulff 1973) and a inverse relationship of seed size with light requirement has been observed which confers a good spectrum for the seed germination across a range of germination temperature, so seeds are capable of germinating across a range of temperature within 10ºC to 40ºC but 25-30ºC seems to be optimum for its growth (Felippe et al. 1983). Seeds produce mucilage after getting in contact of water. Population expansion takes place by heavy sprouting after rains and through autogamic and allogamic reproduction (Aluri & Reddi 1989). As each plant species displays its own reproductive strategy, i.e. a set of characteristics, which maximizes the chances of its offspring to overcome the hazards posed by environmental stress, competition, predation and disease (Fenner 1985) Hyptis also shows strategy for better survival and establishment. It exhibit vigorous growth on the agricultural fields and wastelands. A number of vegetative characters are helpful in the heavy proliferation of Hyptis such as small seed size, prolific seed production (>2000 m-2) forming persistent propagule bank within short period, seed dimorphism, autogamic and allogamic mode of reproduction, good proliferation from the perrenating rootstock, probable allelochemicals and presence of essential oil conferring resistance to it against variety of pathogens. 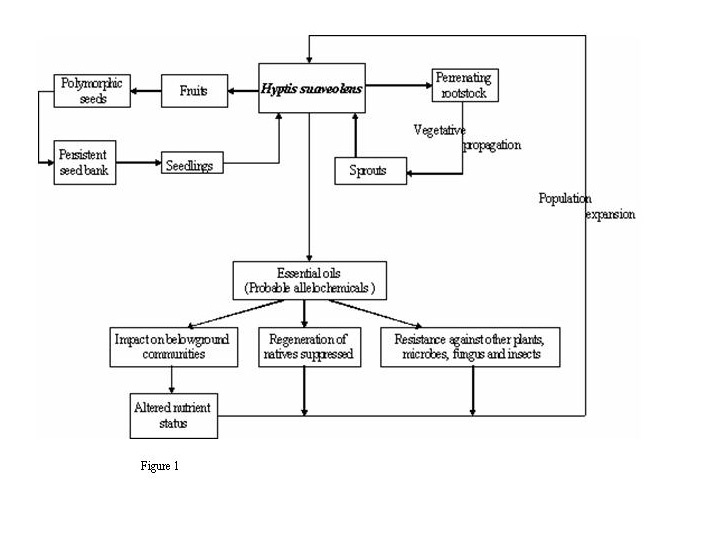 Description of life cycle of Hyptis along with factors favoring its growth is presented in figure 1. The small seed size facilitates burial of seeds because of the ease with which such seeds would penetrate into cracks or small openings in the soil. Reduction in size along with large number of seeds has also been associated with predator avoidance as reported by Fenner (1985). Seed dimorphism in Hyptis is helpful in its germination across a range of temperature conferring year round seed germination. In addition to it small seeds have greater surface to volume ratio showing greater germination rates than in the large seeds (Cideciyan et al. 1982). Seed polymorphism is also helpful in exploration of different microsites (Sagar 1960) or safe sites as described by Harper et al. (1961. Polymorphic seeds as produced by some other species often differ in their germination response to temperature and light as demonstrated by Caves et al. (1966). Different soil qualities viz. soil temperature and irradiance in addition to spectral quality of light reaching to the floor may vary widely over short distances within range of dispersion of seeds of a single individual (Thompson & Grime 1979) so Hyptis could potentially be favoured in different microsites owing to the differential seed size. Further dispersal of seeds across a range of area and different places is attributed to difference in seed size because as compared to larger, smaller seeds may be more easily dispersed; less predated and maintains more favourable water balance on soil surfaces (Harper & Benton 1966). Seeds of Hyptis have spined burr which catches in wool, fur, clothing and other fibrous materials and also floats on water and some movement is also with animal hooves in mud, machineries and other vehicles (Parsons & Cuthburston 2000). . Although allelopathic effect of Hyptis is not well documented but essential oils present in it may confer competitive advantage to it as some members of Lamiaceae family viz. Trichostema lanceolatum (Heisey & Delwiche 1985), Oscimum sanctum, Nepata cataria and Salvia species possesses allelopathic properties owing to presence of essential oils, volatile oils, exudates, leachates and inhibitory zones (Qasem & Foy 2001). Essential oils of Hyptis has nearly 2.3 % terpinene 4-ol (Peerzada 1997) which is reported as main allelopathic inhibitory compound of Trichostema lanceolatum (Heisey & Delwiche 1985). So we can predict that pathogen resistance and decreased recruitment of natives by Hyptis is due to presence of allelopathicals. In addition to all these factors another factor which plays an important role in the species loss in the area occupied by Hyptis is its unpalatability to livestocks due to presence of essential oils so because of avoidance as a fodder other species are heavily used as fodder by livestocks resulting in the loss of other species. Hyptis also has good medicinal value owing to the presence of essential oil, a characteristic feature to the family Lamiaceae. After hydro distillation of its leaves, an average yield of 0.1 % is obtained. Main constituents of the distillate are 1, 8-cineole (32%) and o-caryophyllene (29%) (Peerzada 1997). Hyptis is known to be used for traditional medicine for the treatment of various illnesses and has been found to possess significant pharmacological (Kuhnt et al. 1995), anti-cancerous properties (Mudgal et al. 1997) and tumorigenic (Peerzada 1997) properties. In addition to above, it also has mycotoxic activity against fungus Candida albicans, antimicrobial activity against both gram positive Staphyloccus aureus and Basillus cereus and negative strains of E. coli, Pseudomonas (Olayinka et al. 1999). Besides all these properties it also has insecticidal properties and said to be mosquito repellant (Mudgal et al. 1997). Although Hyptis possess medicinal properties but it is not efficiently utilized in this context. Further damage to the biodiversity of adjoining areas is much greater than its utilization as medicinal plants. To avoid its spread, small plants or small infestation should be pulled out by grubbing. Removal of larger colonies depends on planned use of the area. Use of tall growing crops viz. pearl or bulrush millet (Pennisetum glaucum ) is effectively used to shade out Hyptis. It can also be controlled chemically with atrazine. Exploration of suitable host against the plant may prove to be a beneficial in its removal. Rust disease from Pucinia may seem to be promising but it further needs to be investigated (Cullen & Delfosse 1990). So efforts should be done to check it's spread so that it may not become a successful invader in near future like other invaders in the Indian forests. Aluri, JSR. & CS Reddi. 1989. Pollination ecology of Hyptis suaveolens (Lamiaceae). Proceedings of Indian National Science Acaademy 5 & 6, 411-416. Aluri, JSR 1990. The explosive pollination mechanism and mating system of the weedy Hyptis suaveolens (L). Plant Species Biology 5, 235-241. Cavers, PB & JL Harper 1966. Germination polymorphism in Rumex crispus and Rumex obtusifolius. Journal of Ecology 54, 367-382. Cideciyan, MA, AJC Malloch. 1982. Effect of seed size on the germination, growth and competitive abilities of Rumex crispus and Rumex obtusifolius. Journal of Ecology 70, 227-232. Cullen, JM & ES Delfosse. 1990. Progress and prospects of biological control of weeds. Proceedings of Ninth Australian Weeds Conference, 452-470. Felippe, GM, M Polo, VJM Cardosa & RCL Figeiredo-Ribeiro. 1983. Germinacao da unidade de dispersao de erva invasora hyptis suaveolens . An Sem Reg Ecol 3, 245-261. Fenner, M 1985. Seed Ecology. Chapman & Hall, London. Harley, RM. 1988. Revision of generic limits Hyptis Jacq. (Labiatae) and its allies, Botanical Journal of Linnaean Society 98, 87-95. Harper, JL, JN Clatworthy, IH Nc Naughton & GR Sagar. 1961. The evolution and ecology of closely related species living in the same area. Evolution 15, 209-227. Harper, JL & RA Benton. 1966. The behaviour of seeds on the surface of water supplying substrates. Journal of Ecology 54, 151-166. Heisey, RM & CC Delwiche. 1985. 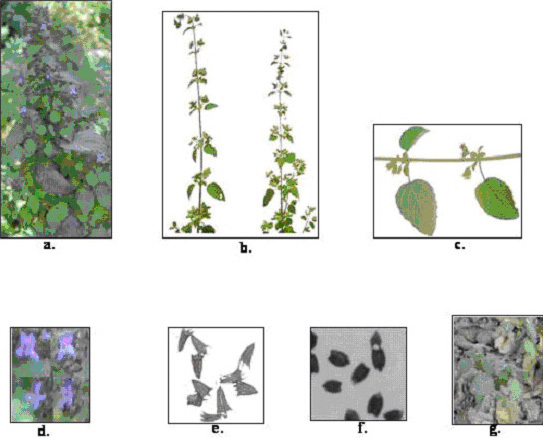 Allelopathic effects of Trichostema lanceolatum (Labiatae) in the California annual grassland. Journal of Ecology 73, 729-742. Hickey, M & C King. 1988. 100 families of flowering plants. Cambidge: Cambidge University Press. Holm, L, JV Pancho, JP Herberger & DL Plucknett. 1979. A geographical atlas of world weeds. Wiley New York. Hutchinson, J & JM Dalziel. 1963. Flora of West Tropical Africa, Crown Agents; London, 452. Keller, S & S Armbuster. 1989. Of Hyptis capitata by Eumenid wasp in panama. Biotropica 21, 190-192. Kuhnt, M, A Probstle, H Rimpler, R Bauer & M Heinrich. 1995. Biological and pharmacological activities and further constituents of Hypatis vertcillata. Planta Medica 61(03), 227-232. Olayinka, T, HE Mr. Olusegum E & A Bolanic. 1999. Antimicrobial activity of the essential oils of Hyptis suaveolens leaves. Fitoterapia 70, 440-442. Mudgal, V, Khanna KK & Hazra PK. 1997. Flora of Madhya Pradesh II Botanical Survey of India, 403-404. Parsons, WT & Cuthburtson EG. 2000. Noxious weeds of Australia. CSIRO publications, 490-491. Sagar GR, 1960, the biology of some sympatric species of grassland, Ph. D. thesis, Oxford university. Srivasatva T. N. 1976, Flora Gorakhpurensis 262-262 Today & Tomorrow's Printers & Publishers flowering and fruiting starts after a short vegetatve phase in October and remains till February. Stone B, 1970. The flora of Guam Micronesica 6, 511-512. Sturtz JD, Harrison PG & L. Falvey 1975. Regional pasture development and associated problems. II Northern Territory Tropical Grasslands 9, 83-91. Thompson, K & JP Grime 1979. Seasonal variation in the seed banks of herbaceous species in contrasting habitats. Journal of Ecology 67, 893–921. Tothilll, JC, Mott JJ & Gillard P. 1982. Pasture weeds of the tropics and subtropics with special reference to Australia in biology and ecology of weeds (eds Holzner W and Numata M.) Dr. W. Junk Publisher, 413. Verma, BK & Mishra BK. 1992 Flora of Allahabad district UP India. Walter, H. 1963. Uber die Stickstoffanspruche der Ruderalpflanzen. Mitt. Florist- Soziol. Arbeitsgem. NF 10, 56-96. Wealth of India, 1959. CSIR, New Delhi, vol. V, 159. Willis, JC. 1973. Dictionary of Flowering Plants and Ferns, (Rev. by Shaw, A. K.) Cambridge University Press; London, 587. Wulff, RD. 1973. Intrapopulational variation in the germination of seeds in Hyptis suaveolens. Ecology 54, 646-649. Yoganarasimhan, SN. 2000. Medicinal Plants of India (eds Srinivasan, V. and Kosal-Ram, N.), vol. 2. Cyber Media, Bangalore, 282.